An entertaining game, although with few goalscoring opportunities watched by the biggest crowd seen for an Imortal game for many a while. Not easy to estimate but I would reckon on 250, maybe 300 including a fair number of visiting fans. Mysteriously, their ultras, with obligatory big drum and huge flag, didn't turn up until half an hour after the kickoff. When they started, the home supporters responded in kind, making for a good and noisy atmosphere. A fairly strong wind, blowing straight down the pitch, did make control difficult with many passes being over-hit. That made amends for a penalty awarded in the first half, which he took and was fairly easily saved by the visiting keeper Joel. There were very few goalscoring chances in the game as the numbers below show. Moncarapachense were guilty of poor passing throughout and of two horrendous misses, that had players and fans alike waving their arms in frustration. One in the first half should have been a tap-in from about 3 metres out which was steered wide and, right at the death, a header at the far post went wide with Imortal's keeper Pereira helpless. Other than the saved penalty, Oliveira saw a header graze the goalpost and managed a total air shot in stoppage time at the end. Maia had a good shot well saved mid-way through the first period, while Pereira made a somewhat theatrical save in stoppage time at the end of the game, just before the major miss that should have tied the game. A blot on the game was the number of 'fouls' committed by Imortal (some which were not! ), bringing a total 23 free kicks and four yellow cards. A fifth yellow went to Pereira for running half the length of the pitch to get involved in a melée. Imortal's next game is away to the 11 Esperanças on Saturday. A stronger side than fielded in the recent cup match will need to get a result if Imortal are to stay top of the League. No ground lost though as the other top teams either drew or lost. 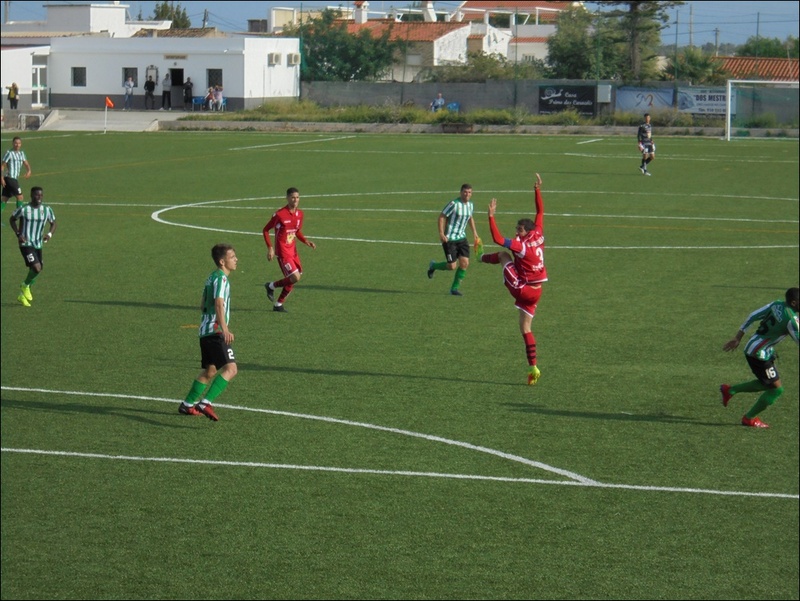 Next Saturday Imortal will be at home to Almancil (currently 6th) and the final match is away at Guia on the 23rd. 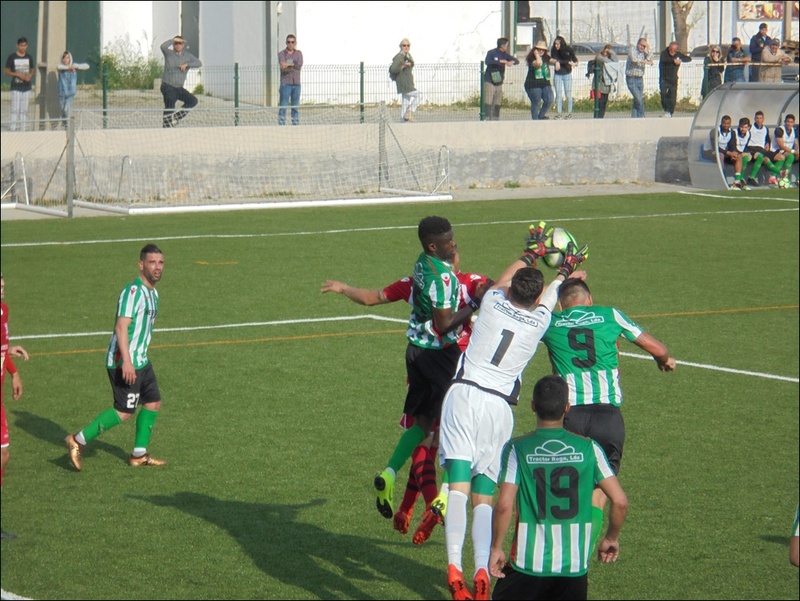 Yesterday Imortal 0 - 1 Almancil three dropped points that may be regretted but a top six place for the second phase is guaranteed. Imortal failed to create more than a couple of decent chances and fell to a late headed goal. Final game of the first phase will be away to Guia next Saturday. NB the league table on the official Algarve FA website is wrong. 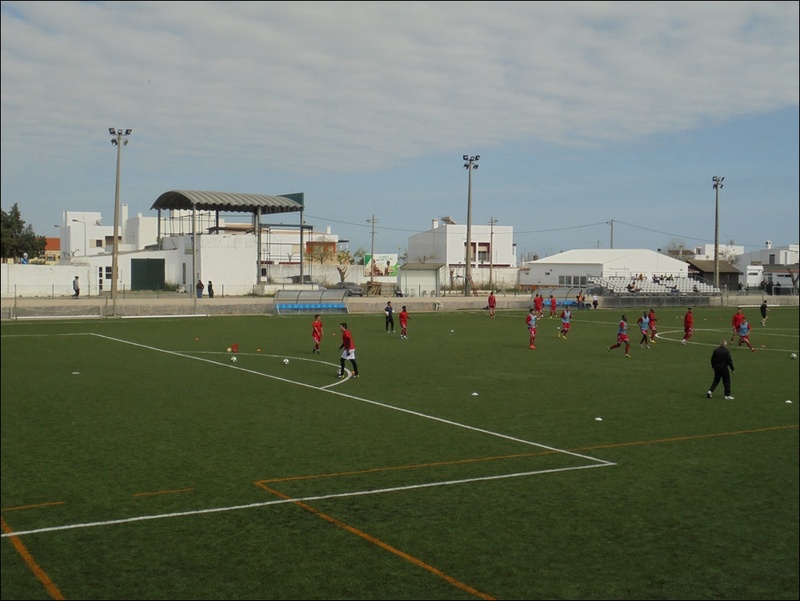 It omits the game between 11 Esperanças v Silves, a 1-1 draw played on Wednesday 16th January. How can an OFFICIAL website completely miss out a result? I was unable to go but will be able post a few words later. Imortal finish the fist phase in second place and will therefore be among the top six playing a further round of matches to determine the league championship. Not much detail I can offer for Saturday's game as I can find no reports ion local media. Suffice it to say, from our man on the spot 'Lofters' that it looked like all the front players were back having been suspended en masse for last week's game, and they started very well. Quick and incisive with Guia not able to cope. Goalie kept them in it until 25th min when a corner swirled in to the far post to be headed in. Within two minutes a winger was decked unceremoniously in the box 2-0. Imortal then knocked off for the 30 minutes around halftime. Aimless boots upfield yielded nothing and Guia came into the game without making any chances. After the hour Imortal roused themselves, played better and scored a couple more, with Guia getting theirs late on. Fixtures for the second phase finally available! Imortal begin with a home game v Lagos on 9th March ko 1500hrs. A game which Imortal could and should have won, but poor finishing and defensive errors cost them dearly. Paollo Oliveira missed an almost open goal in the final minute of normal time that could have salvaged a draw, but having beaten the last defender and goalkeeper he pushed his shot just wide of the goal. Most of the game was end to end stuff in a fairly stiff breeze. In the first half especially there were few goalscoring opportunities. Lagos took the lead on 11 minutes, a cross from the left was deflected into the Imortal goal, general opinion was that it was a leg of goalkeeper Nélio Pereira. He was not to have good day! By half time three Lagos players had been yellow-carded for fouls. There was an undercurrent of attitude throughout the game. The second half began badly for the home team. The normally reliable Pereira misjudged a cross, could only get finger-tips to it. It reached the edge of the penalty area whence it was blasted back unstoppably by 'Chico'. But the two goal lead lasted only two minutes. Imortal attacked, Mateus Vieira was first pushed then sat upon by a defender just about on the six yard line. Penalty to Imortal, well struck by Tidjeane Baldé, who played wearing a Petr Cech style scrum cap. Up and down the game went again. Lagos had one promising attack foiled by the award of a very dubious free kick, which even the Imortal fans could barely believe. A spell of pressure by Imortal yielded several corners in quick succession, but nothing came of them. By this time the Lagos players were going down like flies, with 'cramp' in a cynical attempt to break the flow of the game. They carefully did this as far away from their bench as possible, their fat trainer had to run a long way each time to restore his charges to health. Then came Oliveira's alarming miss, groans all round in the crowd of around 200. The referee than announced five added minutes, which became seven as the game of old soldiers continued. Canito earned his money right on time with a superb last ditch tackle to keep down the damage. The other two games in the promotion group were draws, so the loss isn't a big one just yet but with only nine games left a result is needed next week, when Imortal travel down the road to Quarteira. Yellow cards : Imortal 2 (Tidjeane and Pedro Rodrigues, both for dissent); Lagos 3. In other Portuguese football news, a player in a game of the Beja district league was arrested on the field by local GNR for attacking the referee and in Braga local supporters attacked coaches bringing fans from Guimarães for the local derby last night. Police resorted to firing shots in the air to disperse the mob. Braga won the game 1-0 which was watched bu just under 17,000 the stadium being 55% occupied. A last minute equaliser by captain Pedro Rodrigues saved a point for Imortal they barely deserved in a 2-2 draw at Quarteira. More to follow. Pretty awful stuff not helped by a very uneven pitch. Imortal's insistence on playing the short passing game got them nowhere. Eventually the approach changed but by them they were two goals down. The equaliser came in the last moments of normal time, scored with some skill by captain Pedro Rodrigues. So poor were Imortal in the first half that the only shot of any description was a penalty scored by Tidjeane Baldé on 37 minutes. The game as whole was very much stop- start - stop. There were no ball boys covering the vast acres of the stadium and great reluctance on the part of the home team to throw a new ball in when needed. Imortal went one down mid-way through the first half, from a penalty, after a combination of defenders conspired to not to clear the lines and eventually gave away the spot kick. On the half hour this became 2-0 when goalkeeper Pereira seemed to change his mind when coming for a cross, which went past him to Van Damme, unmarked on the far post for an easy header. Imortal did then abandon plan A to become more direct and were rewarded on 37 minutes when Oliveira was chopped down just inside the area. The penalty was given and scored. Imortal started the second half in a real hurry. The hosts had a big shout for a penalty early on but the ref ignored them. Imortal pressed forward, Quarteira massed in defence. Rodrigues had a good chance with a header but it went straight to the goalkeeper. A good cross found Betinho a few yards from goal. Trying a backheel flick or something he totally missed the ball. Quarteira's defence almost contributed when a wild, sliced, clearance spun back towards the goal and had to be clawed from under the bar by the 'keeper. The clock was ticking down when a good move down the right wing enabled Fábio to slide in a good ball in to Rodrigues, who calmly slotted home under the 'keeper from the corner of the six yard box. Five added minutes were announced which became six as the familiar spoiling tactics came into play. Quarteira have no realistic chance of winning this league so their ploy is obviously to spoil! The massed ranks held, Imortal had to settle for a draw. This and other results placed Imortal fourth of six, four points behind leaders Moncarapachense. 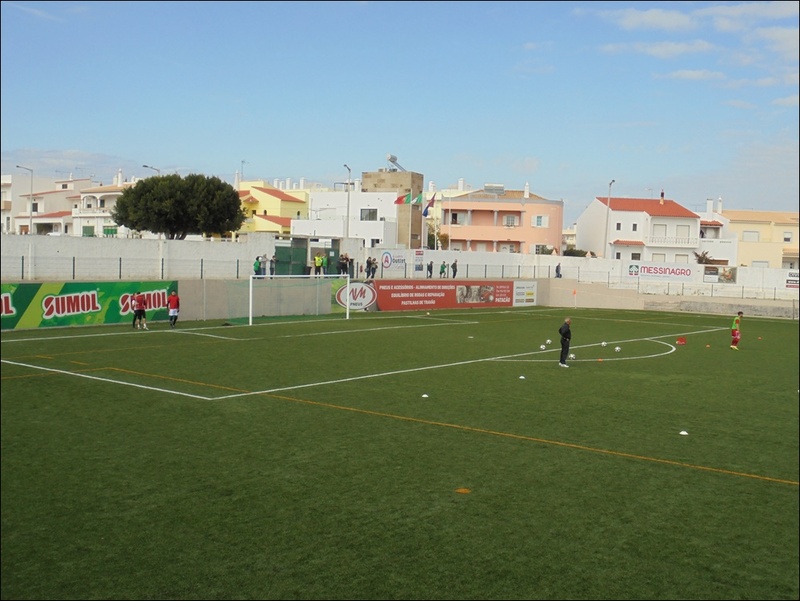 Next Saturday they face the other 'no hopers' Almancil at Albufeira stadium ko 1500hrs / 3pm. Free kicks conceded : Imortal 18, Quarteira 10 including the penalties. Yellow cards : 2 each. Imortal 5 - 0 Almancil more to follow. At last a performance with good finishing! Although Almancil were fairly poor, goals still have to be scored. This was a convincing win and highly necessary with two of the other three teams at the top also winning. Next week's visit to Moncarapachense is now the proverbial six-pointer. It took the game a good twenty minutes to get going on a very windy day. Imortal were playing into the wind. Defenders were taking no chances, the big boot upfield being the order of the day. Gradually the game took on some shape, with Imortal playing the better football. 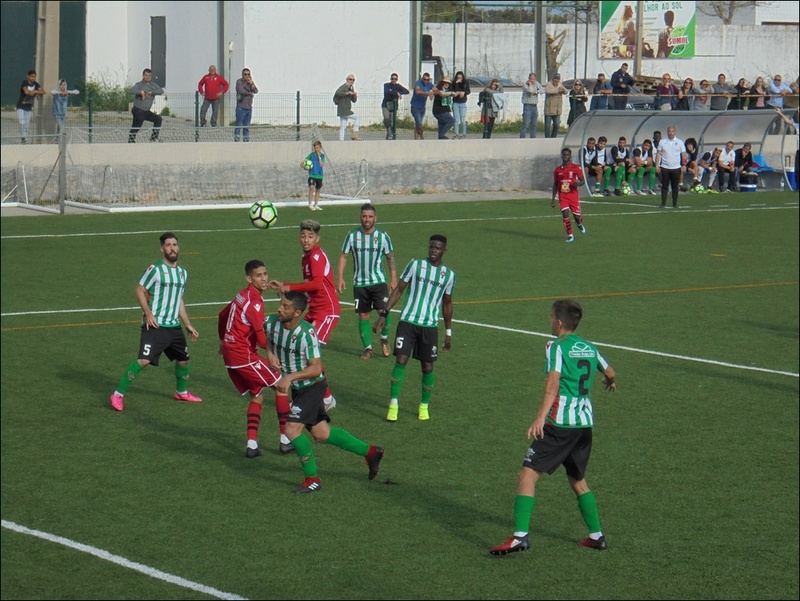 A god move downfield between Chico and Oliveira put Almancil's defenders on the back foot, the final pass went slightly astray but a rebound off a defender's leg fell nicely for Oliveria who drilled the ball low and hard past the 'keeper from the edge of the area. Almancil were weaving pretty patterns in midfield but were woeful in front of goal, shooting high and wide when chances came their way. Imortal increased the lead on the half hour, Tidjeane Baldé's junking run into the penalty area from the left couldn't be stopped. Fans though he had overdone it, but he kept his feet and prodded the ball over the line from close range. The same player scored again just before half time, this time from the penalty spot following a clumsy and totally unnecessary challenge on Oliveira. Three-nil at half time after a very satisfactory 45 minutes. The second half started well, with Imortal going further ahead nine minutes in. A good move down the left ended with Oliveira's shot goal bound, the ´keeper blocked it but the rebound was again kindly, a toe poke was all that was needed to score. Imortal sat back a bit after that, Almancil began to play but their spectacularly useless strikers failed all but once to make anything of the possession. Canito was on hand with a good block when danger did once present itself and good cross went behind everyone from one side of the goal to the other. Captain Rodrigues needed to shout at a few Imortal players, urging them to pay attention! The brief storm was weathered. With the wind at their backs, Imortal were using the long ball down the middle. Oliveira worked out that by standing just inside his own half and using his speed the defenders could be in trouble. So was he unfortunately, as the ball two or three times ran away from him after he had outpaced the defenders. The fifth goal came after an epic blunder between defenders left Flavinho with the ball on one side of the six yard area, Oliveira on the other and only the helpless goalkeeper in front of them, Flavinho carefully crossed to Oliveira who tapped in. 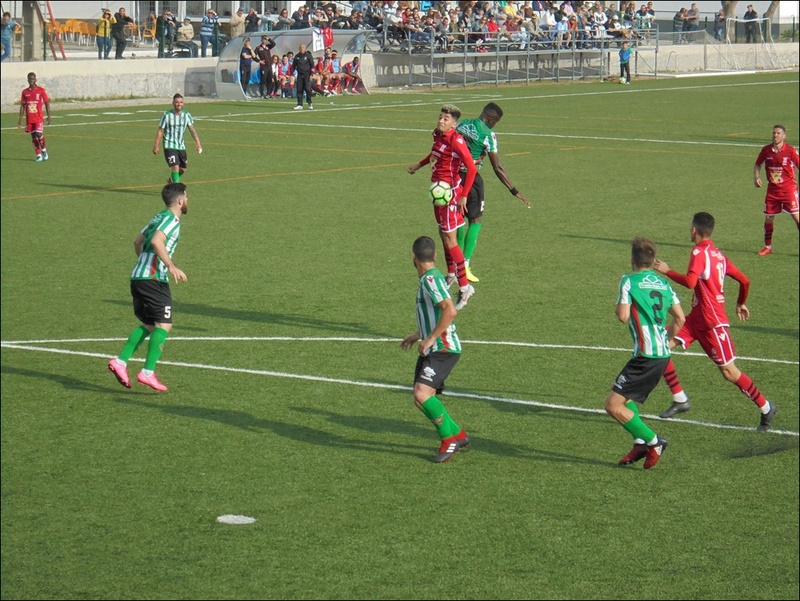 One the game's strange statistics was clocked after 25 minutes of the second period when Almancil conceded just their second free kick of the half. They had been that far away from the Imortal players. Another was Imortal's first corner, won in the second minute of added time at the end. 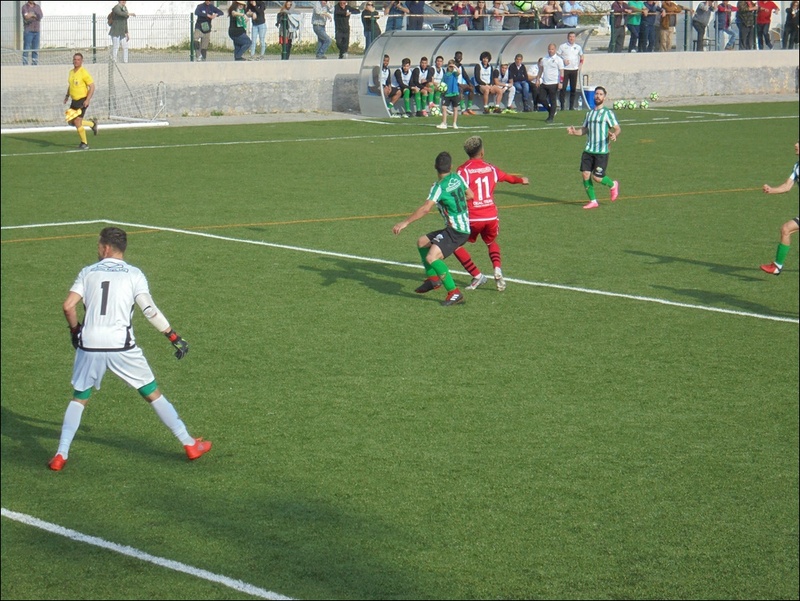 Almancil did mount another short spell of pressure, forcing four corners in two minutes. Defenders were again taking no chances in the strong and swirling wind. The final minutes were played out quietly for Imortal's biggest win of the season by far. Top of the table with seven games to go reads : Moncarapachense 47 points, Lagos 46 and Imortal 43. Next week Imortal travel to Moncarapacho and it's a 1600hrs / 4pm kickoff. Yellow cards : just 1, for Almancil. Imortal's realistic chance of the title disappeared in a game that grew increasingly fractious and finished with two general melées and two red cards, one for either side. It was 1-0 at the time, with Imortal throwing everything and everyone forward. A counter-attack by the hosts two minutes into stoppage time yielded a corner, their first of the game, which Imortal failed to clear properly. Flavinho received a second yellow for tripping an opponent. As he went off he was confronted by one of the unused substitutes on the home bench. Obviously words were said, Flavinho reacted and within moments there was the usual mass pushing and shoving. The offender from the bench also saw red. It was seven minutes into added time when Moncarapachense finished off a thoroughly demoralised Imortal with a second goal. Most of the game was played in midfield, with Moncarapachense showing why they are top of the league. They are disciplined (mostly! ), organised and very quick to close down space. Hardly a chance on goal has been created when they took the lead on 26 minutes. A quick break down the right, cross to the near post and a well taken shot. it was right down the far end. Unusually for grounds here, one can watch from behind a goal. More of that later. Imortal were becoming agitated with their opponents well executed tactic of running into them, going down and claiming free kicks, thereby obtaining several. But there was a response and just before half time, a great effort from 20 metres by Umaru Baldé required a good save from Rosario in goal. The second half was mostly Imortal on the ball but, try as they might, they couldn't get past the defence. Oliveira couldn't get into the game at all, closely marked and at times more or less sulking out on the left wing. He did strike a good free kick from the very edge of the penalty area, but that was blocked by an eight man wall. Everyone was playing forward, the counter-attack was on for Moncarapachense but they failed to trouble Pereira in the Imortal goal. Up and down the game went, there only a very few wayward efforts from either team and a some crosses fairly easily dealt with by both goalkeepers. Then came the display of five added minutes shortly to be followed by the assorted incidents with which proceedings came to a close. That result leaves Imortal seven points behind the leaders with six to play. Red cards : One each. The ref didn't help, waving cards around as if they were swords. 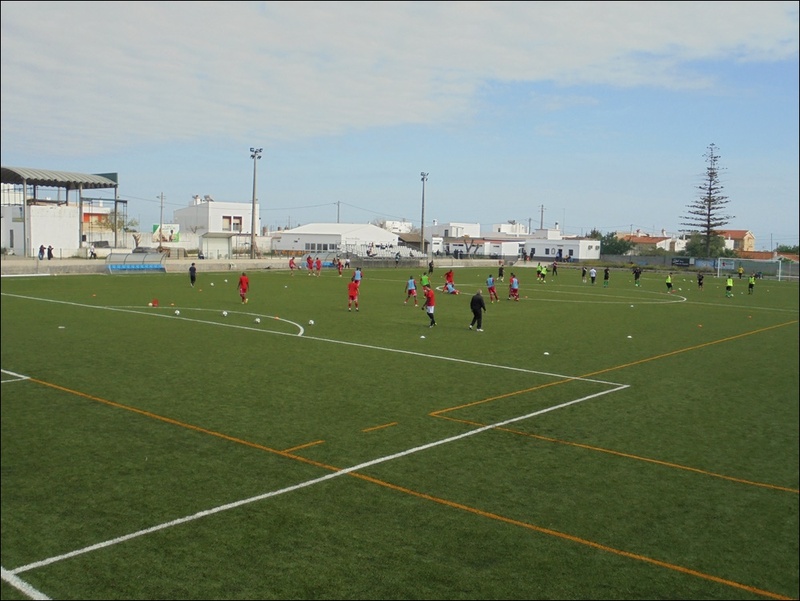 Now some more about the ground at Moncarapacho. I cannot fault the clubhouse and bar, possibly the best I have been to around here. There were about 50 people in there all afternoon watching Braga v Porto on tv. About 130 watched the game outside. The synthetic pitch is cut into the side of a small hill, so at one end the spectators can stand and watch from a height of about three metres above the pitch. The only seats are in a kind of Meccano set structure bolted to one side and can hold about 100 at the most. To think that this place will almost certainly host national third division football next season! Imortal in red. First pic is of the seating area, then some general views of the ground. Today : Imortal 1 - 0 Os 11 Esperanças - pretty poor game with the only goal being a penalty. Report to follow on Monday. Pretty poor stuff overall, not helped by a blustery cross-field wind and the occasional shower. The only goal of the game was scored Umaro Baldé from the penalty spot, thirty minutes into the second half after the visitors 'keeper needlessly brought down Paollo Oliveira at the side of the penalty area. Imortal played a lot of the game in midfield, often too many passes and no thrust in the first half. They created only a couple of half chances in the first half hour before a great move between Oliveira and Chico ended with the latter shooting just wide. Baldé put a free kick wide just before the break. For their part, the 11 Esperanças were content to sit back and let Imortal do the running around. They had only two shots of any description in the first period. The visitors made more of a game of it early in the second half, but their finishing was woeful. They also started to go down in style at any contact, resulting two yellow cards for Imortal and eventually a straight red harshly shown to Mateus Veira, the most innocuous of players. Baldé had another chance fly just wide before the penalty award. The last fifteen minutes were very untidy indeed although Imortal's defenders did have a little bit of work to once five added minutes were announced. A free kick in the dying second gave the visitors an opportunity to grab an undeserved equaliser but again the shot went wide. Moncarpachense 51 points, Lagos 49 points, Imortal 47 points and 11 Esperanças 44 points. There are no games next weekend on account of the Easter holiday.